I’ve been working on a number of projects that needed either decorative or non-rolling edges. As I’ve mentioned to several friends, I may have to explain to my husband that teaching at Jimmy Beans Wool is a negative income job. There’s always some new yarn that’s catching my eye. The last blog post talked about improvements in dyeing technology, and Malabrigo is one of the best when it comes to hand dyes. A decorative cast on and bind off wasn’t necessary with this bulky yarn, but the simple Showy Decrease lines are a stockinette variation and tend to roll. You’ll see this cowl is also folded in half. It’s a nice way to create a non-bulky collar that can be pulled up when you go outside to the chilly weather. The following cast on and bind off edges combine the two goals – decorative and non-rolling. Stockinette can roll, on both the top and bottom and side to side. Today we’re looking at the cast on and bind off edge issue. I have other side solutions coming soon but you can check out the Hatch Stitch Edge now. It’s our most popular blog post ever. Many patterns fight this roll with instructions that say “cast on and knit 2 rows”. It is effective as you can see in the lower photo, but does it pass the pretty test? My solution combines a pretty cast on (Resilient Cast On) and bind off (the fantastic new Knotted K2Tog Bind Off) with a few common stitches: slip, seed, garter and knit 1 row below. How they line up is the key to how this edge looks and functions. It’s really hard to get cast on and bind off edges to match, these are pretty close. Link to other blog posts about the Resilient Cast On and Knotted K2tog Bind Off for more details (including video tutorials) on these techniques. Links are included below. ** The free PDF download swatch tutorial has repeat details so you can actually knit the swatch. Below is just the concept. Cast On 3 sts for every 2 working sts with long tail cast on. Multiple of 3 plus 2 in this case for odd result. Continue in stockinette or your stitch pattern. This edge flares a little so use appropriately. I tried it on a hat and it was too loose. OK, so there are a bunch of details in there. None of them are hard on their own but I thought a printable handout and quick video would help. Soooo, just for you, check out the links below for all of that. You Tube Overview video of these edges and bind off close up. 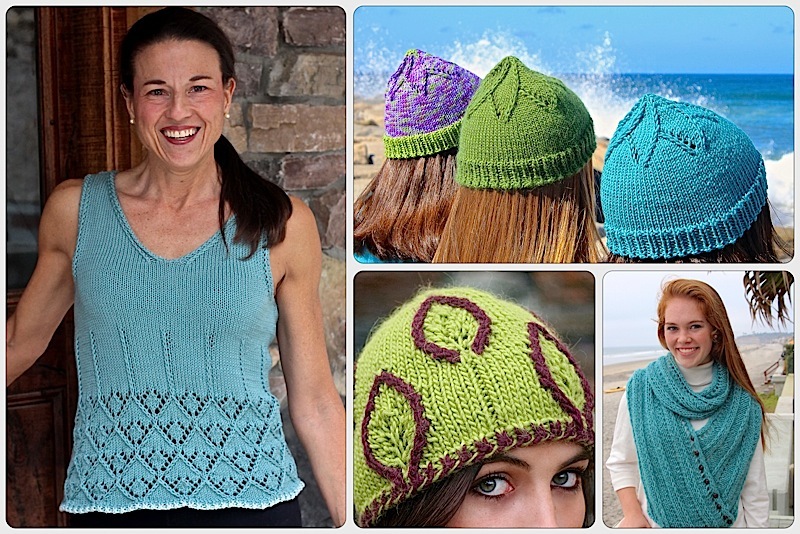 The Malabrigo Caracol yarn and free pattern links are on my website. Hi. It’s knit 1 row below. The pdf tutorial has a photo of how to do it. The pdf tutorial has a photo of knit 1 row below on a KNIT stitch. However, in the tutorial for the NonRolling edges you would knit 1 below into a PURL stitch. I can’t figure out how to do that. I just read more in your blog. I use to live in Lake Tahoe south shore. I know it gets cold! I am living in Oahu. Still miss Lake Tahoe. Thank you again for your ideas! We’ve lived all over the county and love living in Tahoe. As I type (on March 16th) I’m watching snow fall outside adding to the 27″ we got last night. I planned ahead and have lots of knitting to do and no where to go! I’m knitting a poncho in stockinette and,of course, the edges are rolling. What type edge can I pick up and knit to eliminate rolling? This entry was posted on November 20, 2017 by Laura Cunitz in Edges, Free Downloads, Nuances, Patterns, Scarves, Yarn & Yarn Shops and tagged jim, knitting bind off, Knitting cast on, non-rolling edges.